How many rowers are in this boat? This comes from one of those classic inspirational or motivational posters, and is found in the lunch room at my current workplace. We can see seven, which means this must be an eight. 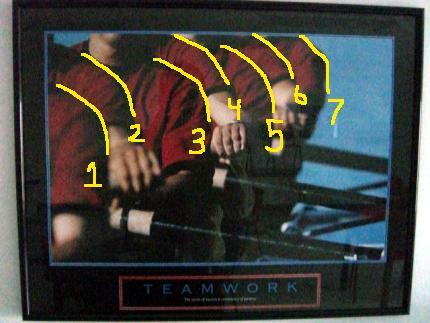 Eight people rowing, each with one oar. One person just got cut off in this photo. That’s fine. But let’s take a closer look at two of these people, numbered three and four above. I highlighted number three in green and number four in red. Three’s oar can be seen clearly to the right. Four’s oar must be going to the left—you can see his hand on the end of it. But wait a minute…. Who’s holding this oar? It looks like the oar in front of number four is being held by the guy behind him, and the same for all the other pairs in the boat. Either this is a revolutionary new rowing style, or this motivational poster has just taught me that it’s okay to falsify photographs if it gets the job done. Looks like this Inspirational poster may be a blown up image of the one you have pictured. I just zoomed in on the image and there are only four in that one. You should create your own demotivational poster with this explanation. Have you ever considered the boat rowing a bucket? That would explain the picture. Hmmm…. a bucket might be a good idea. You’d need someone rowing starboard side between what I’ve labeled 3 and 4 to hold onto that mysry oar, conveniently hidden behind 3′s body, but then what’s going on in bow four? 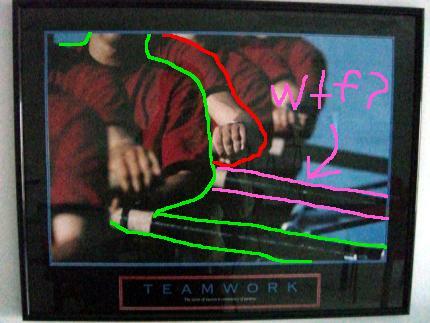 It looks like three people in a row are rowing port. Not likely. It makes more sense for stroke seat to be off the left side of the image and that first shoulder be 2-seat rowing starboard. It may just be a trick of perception that has the oarlock of each starboard seat show up below the outside hand of the person in front. It looks okay for 3 seat and 4 seat, but towards the back it looks like, for example, bow’s oar is in front of 7-seat’s body. It’s still suspicious. False. You can cleary see that 5 seats hand is not on that oar. It appears that the eighth person is hiding behind him in this picture.